Welcome to Rein Naturals, where we use only high-grade pure essential oils for our blends. We specialize in easy to use products that give you more time to spend enjoying life’s activities. We are based in Florida, but can ship almost anywhere that your adventures may take you. Check out our product line or contact us to create a custom blend specifically for your dog, horse, or self! Rein Naturals’ owner, Celine Reilly, was showing her horse, Vegas, and realized they needed something to curb the show nerves and become more focused on the task at hand. Wanting something natural and not drug related for both her and Vegas, she started shopping. However, there was nothing available for horses and riders. Celine did not accept this as being the end, so she began researching holistic and natural alternatives. This search led to essential oils and the belief of them helping with many aspects that she needed. So, she started shopping for essential oil products. Again, nothing for both horse and rider. Finding an interest in essential oils, but needing to know more, Celine decided to pursue this option and came across an Aromatherapy school. She immediately signed up and went to become certified in Aromatherapy. Here, she gained the knowledge to know which oils have what properties, how they should be blended, and how to properly use them. With this, she began creating aromatherapy blends to be used by both horses and humans alike. The blends she created helped her and Vegas’ relationship, both in and out of the show ring. Upon realizing that her and Vegas cannot be the only ones needing these wonderful blends, she decided to allow others to benefit from the products and started a business. Thus, began Rein Naturals. From the original five aromatherapy blends, the company has expanded into offering wound blends, apparel, and accessories that complement our busy lifestyles. Since then, Rein Naturals has extended each of the essential oil blends to not only people and horses, but also to dogs. We look forward to where the future may take Rein Naturals, and hope you join us on the journey! 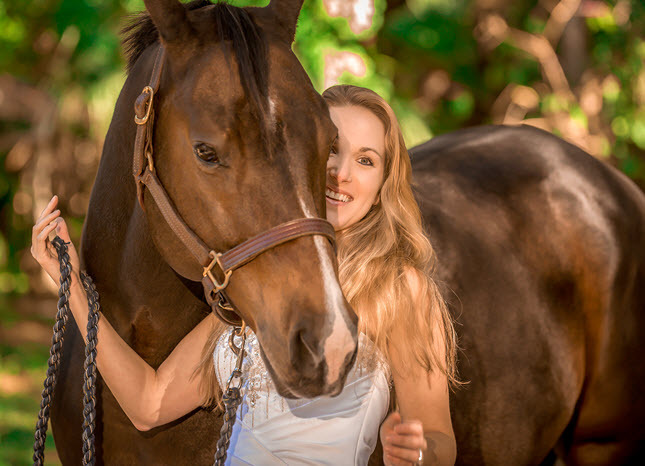 Celine was raised around horses and has always had a passion for them. Having always shown English and Western Pleasure, she added showing Trail Challenges in 2013. Then, in 2015, she switched over to showing her Quarter Horse, Vegas, in Western Dressage and Trail Challenges. Aside from horses, her and her husband, Matt, enjoy many outdoor activities and bringing along their Jack Russell Terrier, Diesel. Cooler, bumper, or travel mug.